What is that circular plot? How do I read the plot? How do I read the table? Your location is at the center of the plot. Each bar on the plot represents a single broadcast channel. Longer bars represent stronger signals. The direction of each bar represents the direction of the transmitter relative to your location. 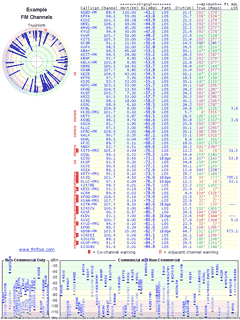 Detailed information about each transmitter is provided in the table to the right. The top of the plot points due north, exactly as you'd see it on a map. If a printout of the plot was placed flat and the top of the radar plot was made to point due north, then each of the bars would point directly at each of the transmitters they represent. The exact direction for each transmitter is also listed under the azimuth column on the table. Azimuth is measured starting with 0° pointing due north and increasing in a clock-wise direction until reaching 360° at north again. In other words, north is 0°, east is 90°, south is 180°, west is 270°, and you end up back at north when you reach 360°. Note: This plot (and maps in general) are referenced to true north, however, most people would use a compass to find their orientation. Depending on your location, there can be a difference of several degrees between true north and magnetic (compass) north. A red "N" is drawn on the plot to indicate the direction of magnetic north. If you are using a compass to orient yourself, the compass needle will be pointed toward this "N" and you can see where the transmitters are located relative to that. The exact azimuth values relative to magetic north are also provided in the table of transmitter details. For more information about the Earth's magnetic field, see the http://www.ngdc.noaa.gov/ web site. The most important value to pay attention to is the "Rx(dBm)" value since that is roughly how much signal you have to work with. Higher values represent stronger signals, but note that the values are negative because of the units being used. There are a lot of factors that affect each situation differently. These are only estimates and your particular situation may be significantly better or worse than indicated. Your mileage may vary. The "Path" and "LOS" data are mostly for informational purposes only. Line-of-sight signals paths ARE NOT NECESSARY to have good reception. FM stations broadcast with very high power and the signals themselves are able to diffract, or "bend", a little over mountains and hilltops. As long as the diffraction angles between the transmitter and your antenna are very shallow (a pretty common scenario), then there should still be plenty of signal power getting past the obstructions. These columns are provided to judge the severity of an obstruction for those rare borderline cases where a signal is just slightly out of reach. For the majority of cases, these values can be ignored. Co-channel interference is when two different transmitters are broadcasting on the same channel and interfere with each other. In the U.S., thousands of broadcasters are sharing the available channels, so naturally, each channel must be shared by multiple broadcasters. When the FCC assigns channels to broadcasters, it tries to keep same-channel broadcasters as far apart from each other as possible to minimize interference. Even so, there are many areas that are "in between" broadcasts on the same channel. Depending on the severity of the interference, the direction of the transmitters, and the type of antenna being used, the end-user might see both, one, or neither of the channels in places where two channels collide. The co-channel warning indicator is placed next to channels in the table that are potentially at risk of having a co-channel interference problems. It does not mean that you will necessarily have problems, but it's just something to watch out for. Adjacent channel interference has more to do with your receiver. Some tuners are built with very poor adjacent channel rejection. That means that if you are trying to watch a weak channel with a very strong signal on an adjacent channel, the tuner can't pick out the weaker channel because the strong one is drowning it out. This type of scenario might occur if you happen to live right next to a transmitter. Channels from the nearby transmitter will be much stronger than channels from distant transmitters, and the difference might be enough to prevent you from receiving those channels that happen to have strong channel neighbors. Most receivers have good adjacent channel rejection and are not very susceptible to this kind of problem, but in case you do have this problem, a warning indicator is placed next to channels at risk of having this kind of interference.